Jazz (also known as Hope) is in the middle of a court case. Jazz, a 10-year-old cocker spaniel, belonged to Shalanda Augillard and during Hurricane Katrina, Jazz was left behind. When Augillard returned, she could not find Jazz. Jazz had been brought to a shelter in Austin, and Tiffany Madura saw a picture of Jazz and immediately adopted her. Madura renamed her Hope and she said that the dog was near death when she took her in. Augillard also saw the picture of Jazz on the shelter’s website, but Jazz had already been adopted, and she couldn’t prove to the organization that Jazz was hers. The dog has stayed with Madura for the past year. Now there is a bitter custody battle over Jazz. After mediation failed to solve the custody battle, the case has gone to court. The hearing was earlier this week and lasted for two days. A California DNA expert was flown in for the trial, two vets testified, and a woman who has a dog that is related to Jazz flew in from Virginia to testify. The judge will decide within two weeks who will keep the pet. This trial is just one of a series of disputes over animals adopted after Hurricane Katrina. Some of the new owners were not convinced that the original owners had correctly identified the animals. Others felt that the pets had been poorly cared for by their Louisiana keepers. Observers say most disputes have been quietly settled in favor of the New Orleans owners once the identity of the pet is firmly established. This entry was posted on Friday, June 15th, 2007 at 3:59 am	and is filed under Dogs, National Dog, Cat & Pet Info, News for Cats, Dogs & Owners. You can follow any responses to this entry through the RSS 2.0 feed. Both comments and pings are currently closed. This breaks my heart. The person who does NOT end up with the dog will be heartbroken. Yet another good reason for microchipping dogs and registering the chip. It wouldn’t solve all the disputes, but it would take away the question of whether or not the dog was correctly identified at least. Stories like this make me nuts. A friend of mine had her car stolen with her puppy in it and everyone spent nearly two months trying to find her. With the pressure on the thieves quickly gave the puppy away and the person who ended up with her waited two whole weeks to do the right thing and call my friend because she was getting attached. WHY is it so hard to do the right thing?! Yes it’s very hard to give up an animal you have, but if you knowingly keep a pet that you KNOW belonged to someone else, that equals kidnapping in my book. They can call it stealing of property all they want, but pets are family. If I somehow lost one of MY pets and someone found them and tried to keep them, you better believe I’d go to court to get them back. I agree that they are family…so why did so many leave them behind? I am not taking about the families that were FORCED out by police or whomever, but those that put their human family in the car and left…leaving the fuzzies behind. I would never leave anyone of my critters behind UNLESS there was a gun to my head…even then, they would probably have to shoot me. They are my family and my children. I know what you mean petmommy. I’d probably be one to say either shoot me or get out of my way because my babies are coming with me! I think they’d have to shoot me, too . But I think the people in Louisiana suffered enough. Give her back her dog! Don’t you guys think? Nor can you claim that something is yours with no proof or proof to the contrary and demand it be given to you. If you lose jewelry, and someone else, somewhere else is given jewelry that looks like your jewelry, that doesn’t make it your jewelry. This is Jazz, no question about it, DNA from her littermate and Jazz matches the dog Hope Floats and was presented in court. This dog was taken illegally from Louisiana by a man delivering supplies and against the state of Louisiana head veterinarian orders for dogs leaving the state of Louisiana during the rescue. She was not given the chance to be reunited with her owner because she was not processed through HSUS and put on petfinder so her owner could find her. They plasted her pictures all over their rescue website calling her their little hitchhiker and using her for fundraising, then adopted her out. That is the only way she was found by accident and the searching efforts of volunteers. I found the black cocker in Dec 2005 on their website and alerted the owner who was constantly looking for her Cocker and she identified the dog as Jazz and contacted them immediately and tried mediation before going to court. The owner has never given up fighting in court to get her dog back although she has been put through delays and stalling. You can’t just come in a disaster and take someone’s personal property and not give them back, it is the law. She has had Jazz since a young puppy. Jazz was left with her parents and when their place flooded they were evacuated by boat several days later and not allowed to bring Jazz. When they went back in to get her the door was broken and she was gone. Many that have helped to reunite these two have waited 18 months for this. (AUSTIN, TX) â€“ Lawyers representing Shalanda Augillard, the New Orleans-area woman who lost her fight to have her dog returned to her in a Hays County court earlier this summer, have announced they are appealing the District Courtâ€™s ruling. This is the first case that has gone to trial in which an owner of a dog lost in Katrina was denied the return of her pet. This is the latest chapter in a two-year ordeal for Augillard, who was separated from her cocker spaniel named Jazz in the chaos ensuing from Hurricane Katrina in 2005. Her parents, who were taking care of Jazz while Augillard was working at FedEx, were ordered to leave Jazz behind by the National Guard when they were escorted from their dry and undamaged home in New Orelans. After the door to their home was kicked in and their home was vandalized, Jazz ended up at a New Orleans-area animal triage center. 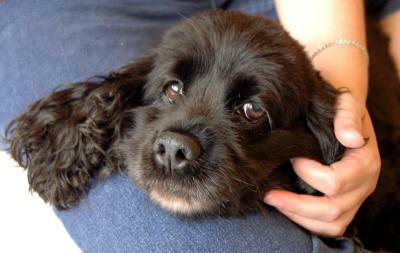 From there, Andy Odam, the director of Austin-based PawMatch, took the black cocker spaniel to Texas, eventually leaving her in the custody of Tiffany Madura, who resides in Hays County. Augillardâ€™s long search for her dog included many trips to Lamar-Dixon, a shelter run by the Humane Society of the United States, where rescued animals were taken for processing. Augillard also listed Jazzâ€™s information on Petfinders.com, the database listing all lost and found animals following the hurricane. Madura. After continued refusals to visit the dog, Augillard eventually turned to the Texas courts for help. The trial concluded on June 13, 2007. According to Austin attorney Susan Philips, who represented Augillard in the case, the outcome was incomprehensible, given the uncontroverted and overwhelming evidence that Jazz is indeed Augillardâ€™s dog. who represented Augillard in the case, the outcome was incomprehensible, given the uncontroverted and overwhelming evidence that Jazz is indeed Augillardâ€™s dog. A fund has been set up to support Augillardâ€™s ongoing quest for justice. Shalanda Augillard leaves her home in Kenner, La., and takes her eight-year-old cocker spaniel, Jazz, to her parentsâ€™ home on A.P. Tureaud in New Orleans. She is on her way to work at FedEx and knows it will be a long shift as they prepare for the hurricane. Jazz frequently stayed with the Augillards when Shalanda worked at FedEx at the New Orleans airport. Even though the family initially considered evacuating New Orleans, as they and many New Orleanians had done many times before, they decided to stay because they did not want to leave without Shalanda. However, they did move their vehicles to higher ground and made sure they had adequate supplies. After working through the night, Shalanda gets off work early Sunday morning and goes home to pack, then goes to her parentsâ€™ home. They spend the afternoon making sure they and their neighbors and friends are prepared. Shalanda leaves to take some supplies to a friend west of them and then is unable to get back to her parentsâ€™ home because a curfew had been put into effect earlier than expected. In the very early morning, Hurricane Katrina makes landfall just east of New Orleans. Within hours, the first of many levees break and parts of the city begin to flood. The Augillardsâ€™ home sustains little damage and no flooding. Phone service is disrupted, and the Augillards are not able to contact each other. The Augillards provide a refuge for neighbors, several of them elderly people with no families. The National Guard evacuates the family. As Shalandaâ€™s mother tries to board the boat with Jazz in her arms, the Guard orders her to leave the dog behind. She places Jazz in their second-floor apartment with lots of water, food, and access to a well-ventilated porch, thinking they will return soon. CBS reporter John Roberts is on the boat with the Guard. Shalanda succeeds in contacting her parents and learns that they were forced to leave Jazz behind. FedEx, which never suspended operations, sent teams to survey hard-hit areas to determine the most efficient way to continue service. Shalanda, as a FedEx employee, is assigned to survey the area in which her parents live and goes to her parentsâ€™ home. The door has been kicked out, the home has been ransacked, and the building has been marked with the date of September 7th . Jazz is not in the apartment. Shalanda makes the first of many trips to Lamar-Dixon, a shelter established by the U.S. Humane Society, to look for Jazz, who needed her medication for a thyroid condition. She inputs all of Jazzâ€™s information on Petfinders.com. Andy Odam of PawMatch and Thomas Darnell of Rivers & Reefs leave Austin with a truckload of supplies to assist in animal rescue after Katrina. They are told by a representative of the Louisiana SPCA that they must deliver the supplies to Jefferson Feed Store, an official animal triage shelter operated by the Louisiana SPCA to process animals. The store was staffed by many volunteers, including veterinarians and veterinary technicians. A black cocker spaniel appears at the Jefferson Feed Store Charlotte Lily, a rescue worker, remembers seeing the Jefferson Feed Store Charlotte Lily, a rescue worker, remembers seeing a black cocker spaniel with a group of other animals who had been rescued from the Augillardsâ€™ neighborhood. The spaniel had been examined by a veterinarian and had documentation attached to her crate. No one reported seeing any other cocker spaniels that day. After being told not to remove any animals from the Jefferson Feed Store, Odam transports a black cocker spaniel to Austin in violation of protocol established by the U.S. Humane Society for dealing with animals displaced by Katrina. Jennifer Hays, then a PawMatch board member, posts information about the black cocker spaniel on the PawMatch blog before Odam returns to Austin, stating that he is bringing a cocker spaniel with him and that sponsorships benefiting Jefferson Feed Store will be available. In an earlier posting, Hays stated that PawMatch is a 501(c) (3) organization, which it was not. The PawMatch blog recounts Odamâ€™s return to Austin with a black cocker spaniel. Odam later stated in his deposition that he took the dog so that he could provide her immediate medical care and so that he could put a face on his rescue efforts. A picture of the dog appeared on the blog right above a PayPal button. Andy Odam and PawMatch place the black cocker spaniel in foster care with Catherine Danie of ARF, an animal rescue group, in Wimberley. At the time of placement, Odam had not provided any medical care for the dog. Another ARF volunteer takes Jazz to veterinarian Dr. Thomas House at San Marcos Veterinary Clinic. Dr. House exams Jazz and determines that she has numerous health issues that are all treatable. His tests indicate that her urine contains triple phosphate crystals and that she is heartworm NEGATIVE. He suspects that she has bladder stones and that she is hypothyroid. The ARF volunteer declines any further treatment. PawMatch posts that the cocker spaniel needs a new foster home. Tiffany Madura agrees to foster the black cocker spaniel. Madura takes the dog to Dr. Barrett Donop at Oak Springs Veterinary Hospital in Austin. The dog had received no veterinary care in the interim. If this is Jazz, she has now been without her medication (for thyroid problems and urine crystals) for almost a month. Dr. Donop says that there is no evidence of stones. He does not check her thyroid. The dog undergoes surgery for removal of bladder stones at Oak Springs Veterinary Clinic. A tip from Barbara Cotters from Virginia leads Shalanda to the PawMatch web site, which has a photograph of a black cocker spaniel on the home page, along with a link to contribute to PawMatch through PayPal. Shalanda notices that the dog has white markings on her mouth that are very similar to Jazz’s distinctive white markings. Shalanda contacts Odam, who refuses to let her see the dog. Shalanda continues her attempts to persuade Andy Odam to allow her access to the dog on his web site. She provides the medical records that she was able to retrieve from Jazzâ€™s veterinarians (their clinics had been destroyed by Katrina) to Louisiana Deputy Attorney General Mimi Hunley, who tries to negotiate a meeting between Augillard and Odam. Odam cuts off contact with Hunley. Many people involved in animal rescue throughout the United States try to arrange a meeting between Shalanda, Odam, and Madura. It is later learned that Madura used at least three different user names to post information discouraging the return of the cocker spaniel to anyone; under one of those names, she asked Barbara Cotters to remove all of the information she posted on her website about the PawMatch cocker spaniel, contending that the dog should not be returned. Some rescue people contacted attorney Mimi Smith, in Alpine who coordinated the initiation of legal proceedings. waiting. Before the car stops, with the windows and doors still closed, the dog starts barking frantically and charges out of the car the moment the door is opened. She runs in circles around Augillard and her mother and friend, all of whom have tears running down their faces. For the first time since the hurricane, Shalanda is allowed to see the black cocker spaniel. She, her mother, and her friend positively identify the dog as Jazz. while Mimi Smith stays with Jazz. Shalanda, her mother and her friend then begin the drive back to New Orleans. Jazz is held at a kennel at Shalandaâ€™s expense. The first of two parts of the preliminary injunction hearing is held in San Marcos in front of Judge Bill Henry, and Shalanda is in attendance. The temporary restraining order is extended two weeks after the hearing is cut short due to an infestation of tropical mites in the courthouse. comparison testing and to return to the court once the results are received. Two sweaters and a hairbrush belonging to Jazz are sent to Dr. Joy Halverson, a veterinary geneticist at QuestGen Forensics in Davis, CA. Dr. Halverson is a nationally respected DNA expert who performs DNA tests on dogs to verify pedigrees for the American Kennel Club and provides court testimony in human criminal cases. Dr. Halverson reports that even though she found hairs on the sweaters, there is inadequate amplification. She does, however, find a serum exudate encrusted at the base of the bristles of the brush that yields adequate DNA. She then requests a reference sample from the dog in Texas. Attorney for Madura files a motion for a protective order, arguing that Jazz should not be made available for DNA sampling because Augillard, Philips and Smith had access to her on May 5, 2006. Even though Judge Davis had ordered the DNA testing, an additional hearing is required to compel Madura to produce the dog for DNA sampling. Judge Henry orders the defendants to produce the dog within one month; Shalanda is at the hearing. DNA samples are taken from the cocker spaniel by Thomas Beckett, DVM, in the presence of Dr. Donop at Oak Springs Veterinary Clinic . The samples were sealed by Dr. Beckett in the presence of Dr. Donop and Susan Philips. The envelopes were signed by both Dr. Beckett and Dr. Donop and sent to Dr. Halverson. Once more, Shalanda makes the trip from New Orleans to Central Texas. A hearing is held to determine if the Court would allow Dr. Halverson to testify by telephone. The request is denied. Shalanda attends the hearing. Dr. Halverson is deposed in Sacramento, CA. Dr. Halverson travels from California to testify at a hearing regarding the DNA test results. Shalanda comes from New Orleans to attend the hearing. Both are present in the courtroom when the hearing is canceled. The clerk reschedules the hearing for December 12.
certainty the samples match because they came from the same dog.â€ Judge Henry makes no findings, denies the request that Jazz be returned to the kennel pending trial, and orders the parties to seven hours of mediation. The parties mediate for four hours. The parties mediate for an additional three hours but do not reach an agreement. To provide even more proof that Jazz and the dog in Texas are the same dog and to refute the vague inferences that samples had been tampered with, AKC records are obtained by subpoena of all of the litters born to the mother of Jazz. A half-sister of Jazz who was born a year after Jazz from a different sire is found in Virginia. Dr. Halverson compares the DNA from the Virginia dog with the DNA of the Texas dog and determines that they, too, are both related to the same female. Laura Maloney, director of the Louisiana SPCA, writes to Andy Odam, requesting the immediate return of the cocker spaniel he removed from Jefferson Feed Store in violation of established protocol. Odam never responds to that letter. Trial is held in Hays County District Court in San Marcos before Judge Henry. The parties are limited to a total of four hours for the trial, and Shalandaâ€™s attorneys are unable to call eight of her witnesses. Dr. Halverson was present and repeated her testimony from December. Judge Henry faxes a letter to counsel stating that the Court renders judgment in favor of Madura. No explanation is provided. Judge Henry releases his findings of fact, contending that the testimony of Augillardâ€™s witnesses was not credible and alleging that the DNA evidence had a â€œhigh potential for tamperingâ€ even though no evidence of tampering was ever introduced. Susan Philips files a motion for a new trial. Shalandaâ€™s attorney files a notice of appeal. I spent months along with Barbara helping Shalanda look for Jazz. How sad that Tiffany refuses to do the right thing and return this dog to her owner - I don’t know how she sleeps at night knowing this dog doesn’t belong to her and doing everything she can to keep Shalanda from getting Jazz back. Judge Henry should be ashamed of himself! This dog is definitely Jazz - and I pray she gets back to the owner who has loved her from a puppy. Very helpful, thanks for posting this. It is obvious that these people, including the judge, have not behaved with integrity. This dog does not belong to Tiffany, she belongs to Shalanda and should be returned NOW. p.s. — typo on that last date? Should say September 17, 2007 rather than 2005? petmommyofmany, not clear what your comments have to do with this case. The family was confronted by the National Guard, who probably did have guns, who did order them to leave the dog. And, some would disagree with you re whether it makes more sense to risk getting shot and killed on a point of principle ” they’d have to put a gun to my head” rather than: doing what they say, leave without the pet as you are ordered, with the hope that you can sneak back later or find someone else to go back and get your animal as some people managed to do. After all with the gun to the head routine, if they shoot you dead, your animal will NEVER see you again. And in some cases, if the people refused to leave when directed to do so, the rescuers just shot the dog right on the spot, in front of the owner, and then the pet is dead. How is that good for the pet? Maybe best just to do what they say, to ensure no one gets killed and try to get back later. Each situation is unique. Many people were forced to become separated from their family (children, pets, elderly) against their will and are being wholesale blamed for it. Not fair. The shelters were full of dogs after Katrina and they were begging people to come and adopt a pet so they wouldn’t have to euthanize them. They didn’t say to come and foster a pet until the owners could be found, they urged people to come and adopt a pet. When you adopt a pet, it’s yours. How does someone come back years after you’ve adopted an animal and say “Oh, that’s my dog, give it back?” And no, you can’t go take someone’s property like jewelry or TVs after a disaster, but pets are different–someone has to go take them or they’ll die! If someone hadn’t gone and “stolen” the dog, it would have starved to death. This is just a good reason for me not to get my next pet at an animal shelter. Apparrently, if I go out and buy a puppy, then it’s mine, but if I go adopt one from an animal shelter or rescue group, that means nothing. If you love your pets so much, have a plan ahead of time and don’t leave them to die like many did. The original family should just be happy that at least jazz made it, he isn’t a pile a bones to return to and be remorseful for their negligence. Be responsible and have a plan. Katrina victim with pets that did not put them in danger.